OK, OK. I was driving a red 2012 Maserati GranCabrio Sport convertible. I guess I was just begging to be pulled over. Of course, that’s a ridiculous assertion. Almost as ridiculous as the very idea of me owning a Maserati. Really, what difference does it or should it make what I was driving? What you should know is that officers have broad authority and discretion when deciding to pull someone over, and they should in order to do their jobs. They can pull you over for speeding, swerving, a busted taillight, a smoky tailpipe, whatever. They only have to have a suspicion of criminal activity, a traffic infraction, or that the car is not in good condition. The suspicion has to be based on more than a “hunch” but it doesn’t necessarily have to be hard evidence either. Once they pull you over for a legitimate reason, for the most part, everything else is fair game, i.e. the bag of weed on the passenger’s seat. Officers can pull you over for just about any reason, but they can’t pull you over for NO reason. They have to have what’s called reasonable articulable suspicion that a crime or violation is being committed. This can be anything, but has to be something. Officers generally can’t randomly stop drivers to check to see if you’re doing something wrong, rather the suspicion that you’ve done something wrong has to come first. If you get stopped, cooperate. Whatever the circumstances surrounding the stop, don’t make matters worse by being belligerent. Remember, at this moment, the officer has the law on his side and a gun on his hip. You WILL lose this battle. The only time to fight back is after the fact. In my case, I sent letters of inquiry seeking clarity and, if needs be, an investigation. I also placed a call to the department and asked about their policy regarding stops for “insurance” checks. The officer I spoke to wasn’t aware of such checks. In the midst of your frustration sitting on the side of the road with flashing lights behind you, it’s hard to think, “just wait until I send my letter to your boss!” Doesn’t seem so fulfilling, I know, but fighting back after the fact is really your only recourse. The overwhelming majority of police officers are good folks trying to do a good job. But, bias can sometimes creeps in. So, here’s a real conundrum: how do you give an officer the benefit of the doubt when you’re on the side of the road believing he didn’t give you the benefit of the doubt? What you look like and what you’re driving shouldn’t matter. Still, many believe it often does, so I understand why people want to know what kind of car I was driving. It was a nice one. Let’s just leave it at that. The car does not matter. They just love to pull black people over period. Great piece Mr. Holmes! I have been a fan since you first started at CNN, and have held in high regards as one of the better news anchors on television. Hearing of what happened to you in the situation with the police saddened me, but it was not surprising. I, as so many other African-American men in this day and age, have been in the same situation. I thank you for standing tall with your head held high and speaking out not in rage and anger, but steady, intelligent, and stating what happened to you with clarity and reason, backed up by the facts. You have always presented yourself as a professional and intelligent man, and you are a role model for young people all over this nation. What happened to you at the hands of the police was wrong, and I hope and pray that one day our country will finally see an end to such actions by law enforcement. By be able to clearly communicate your ordeal to the nation, your voice is shining fresh light on the injustice and absurdity that so many continue to go through. A wise man once said that until good stands up to evil, evil will keep rolling along and will trample over anything positive. You Mr. Holmes have that stand for good, and I applaud you! That attitude isn’t particularly helpful. I worked for a sheriff’s department for about 6 months & was advised to not add anymore Grateful Dead stickers to my car or I would be pulled over. One sheriff said his rule was 3 Dead stickers & the driver probably had “something” on him making the stop valid. Prejudice & profiling isn’t limited to skin color. Justice should not be unevenly distributed to the rich and/or powerful. That is indicative of monarchy or other less-than democratic societies. There is racism is the population, a police officer is just as likely as anyone else to contribute to it. But its the gun in their hand that makes it worse. The problem lies in the fact that you can only attempt to remedy this incident after the fact and with only your word vs that of the officer for ‘evidence’. The police department can try to dismiss it with ‘he had a bad day’, ‘its only one bad apple’, ‘he had a legitimate reason’ and it just leads to continued systemic issues. Some people get police harassment if they complain. Until the police themselves look to recognize and fight against their internal issues, its just a piecemeal and minor effort at best. But everyone who stands up is worthy of praise. Great advice T.J. “don’t make matters worse by being belligerent” stood out to me. So many people don’t follow up with letters as you did. I hope more do, then these issues should be far and few between. What you are driving shouldn’t matter but it does. Police Officers are subject to the same bias as someone who decides to take out a Sikh temple and unfortunately a few bad pennies can stain an entire otherwise hard working force. What is our recourse when something like this happens? Exactly what TJ did. Make noise. It is the noise that reminds them that we do have a voice. ‘the overwhelming majority of police officers are good folks trying to do a good job.’ Here is where I beg to differ. They are pigs, evil masonic scum, trying to take as many black people off of the planet as possible. How many police officers in states like Alabama, Georgia, Florida, Mississippi etc had parents or grand parents that were members of the KKK, White Citizens Council etc? Blacks should put the burden on so-called Whites to show that they are not perpetuating legacy crimes against Blacks. TJ why don’t Black officers kill young “white” males at the same rates and pull over “White” males at the same rate? Good folks is not what the numbers say. Do the numbers lie? Lastly TJ what is the ethnicity of the officers that are shooting Blacks and pulling us over. If we keep statistics we can pressure Italian Americans, German Americans and Irish American organizations to do more to elimintate Anti-Black behavior and organizations. This is inevitable. Being White is a smoke screen that different ethnic groups hide behind to be anonymous and unaccountable. The Irish American Police Commissioner in NY reduces Black voting power and opportunity for jobs in Police and Fire Departments by frisking and searching Blacks and producing opportunities to get criminal records for Blacks, like 1852! Lastly, track the ethnicity of officers that kill young Blacks. Armenian and Chinese Americans are not pulling the trigger. Let’s give them credit and let the Irish and Italians and Germans and Polish(Chicago) take reputation hits. Which ethnic group makes up the largest segment of Anti-Black groups like KKK and run regression analysis against ethnicity of cops that kill young blacks. Do the math and report it. I admire the dignity and levelheadedness you showed, both during the incident itself and during the silly kerfuffle that followed your Tweet. I’m a white man, and I have to say that I detected absolutely nothing objectionable in the language you used there, so I regret that you’re now feeling a need to apologize for it. You’re simply speaking truth to power, and you’re doing it with a wonderful lack of self-righteousness. Bravo to you. 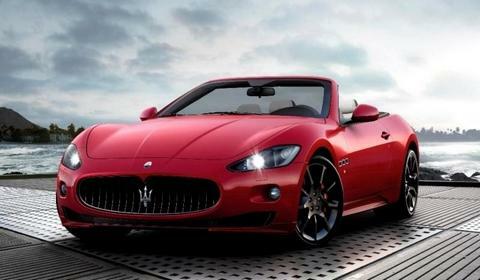 2012 Maserati GranCabrio Sport convertible – really! Yes, I would’ve pulled you over too based on my statistics course in Grad School. That is unfortunate, but that is the truth. Unfortunately, BET and other shows do not depict blacks as having access to toys, such as yours, without illegal activity being involved. So, in your new position, please highlight positive blacks as owning and having access to these types of toys and making sound investment decisions. That will be a start to changing the mindset of these stereotypes. LOL – next time drive a Yugo. When I first moved to Raleigh, NC in 2005, I was driving a convertible, and a police officer pulled me over because I was a Black woman driving a convertible and that was simply unheard of in those parts. My only child, my son, was in the car with me, so I explained to him at that tender age of 10 that this was racial profiling. I am actually fortunate that my son experienced racism with me because I explained it to him and we discussed his feelings about it. The police moved on. However, a few days later, another police officer came knocking on my door at 9 in the morning and asked for my license. He heard that someone was selling drugs at my location. He came in and looked around. I was asleep so I had no idea what was going on. He looked at my ID and then asked for my birth certificate (the short form). After he left, I contacted my brother, a federal Agent, and he told me that WAS NOT standard operating procedure. Anyway, that situation was over, and I never heard from the officer again. My dad is a retired police officer, his brother is a retired police officer, and my first cousin is a Lt in Washington, DC. Since I come from a law enforcement family, I didn’t put much credence to the incident. It was simply being a successful black woman in a small backwards town. I don’t have time to change mindsets, but I do have time to move to a move progressive town. Three years later (2008), I moved on. I am a criminal defense attorney and unfortunately that sounded like a profile stop based on your race and the car you were driving. You handled it correctly by not giving attitude and allowing the officer to figure a real charge to site you for. That officer could have checked your tag while driving behind you and would have known whether the tag was good and if you had insurance or not without seeing your insurance card because insurance info is now in their computer system. Its unfortunate but profiling still exists whether people want to admit it or not. Racial profiling still exists. I do believe that the seriousness is downplayed. I agree with you Dawn. The officer could have easily checked your tags from behind and if he saw any infringement take on a pursuit. It’s amazing how simple situations get swept under the rug – situations that can prevent other serious matters. Had T.J retaliate and start a scene then…let’s just say he would have been headlining every news outlet for weeks. I can see it now! resourcefulness to stay cool, cooperate and not resist. You are a great role model, again. Quality articles or reviews is the key to interest the users to pay a visit the web page, that’s what this site is providing. Thanks so much for providing individuals with a very remarkable chance to check tips from this site. It is always very awesome and also packed with a lot of fun for me personally and my office co-workers to visit your site a minimum of three times in 7 days to learn the fresh issues you have. And definitely, I’m so at all times contented with your special points served by you. Some 2 facts in this post are basically the most effective we’ve had.